Forthglade Complete Meal Grain Free Dog Food (Variety Pack) is a selection of complete and balanced diets that have been made with completely grain-free recipes that are especially suitable for dogs with sensitive stomachs and/or food intolerances. Made with poultry as a delicious source of high-quality protein that is easy to digest and highly palatable, Forthglade Complete meals have also been packed full of essential vitamins and minerals to help support your dog’s overall health and wellbeing. 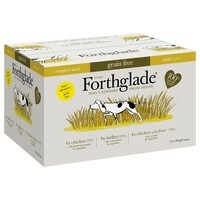 Forthglade Grain Free can be enjoyed on their own as a complete meal, or used as a tasty topper for a good quality dry food.